I love the Middle Ages, and I am always looking for books set in that time period. 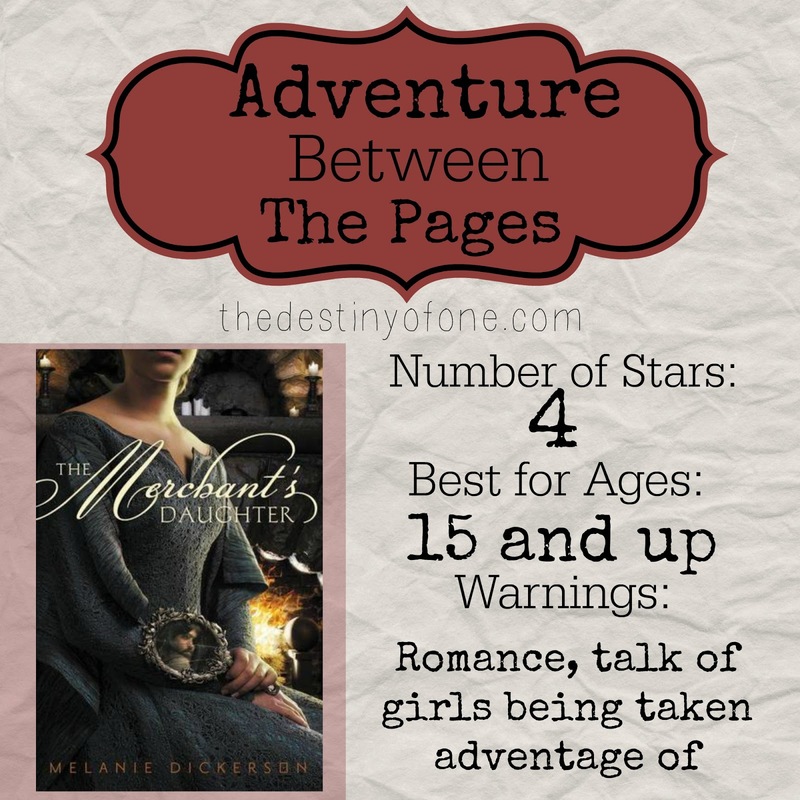 I had seen a lot of really good reviews for The Merchant’s Daughter by Melanie Dickerson, so I decided to get this. I even got a great deal, only $2.99 for the Kindle edition. This book drew me in and didn’t let me go. The characters were well developed and believable. The setting felt so real and very well researched without the author getting carried away with what she knew. My only complaint is that this book was so good, I got very frustrated, because I couldn’t sit down are read it in one sitting. Why did God give siblings the uncanny ability to interrupt at the most pivotal parts of the story? I mean, when I wanted to take a break my siblings were doing things on their own. When I was reading they needed me. I loved the faith the characters have in this book. So many Christian books have a sappy faith, but that was not the case in this book. I loved how God used Annabel’s situation as an indentured servant to grant her the deepest wish of her heart. Okay, for all of you who think I scorn romance I will admit that sometimes the girly-girl part of me comes out. I really liked that this was a re-telling of a fairy tale. Beauty and the Beast is one of my favorite tales, so the fact that this book retold that story made it all the better. Things you might want to know before you read. There is a man that tries to force himself on Annabel, however Melanie Dickerson handled it so well that it didn’t really bother me. However, younger readers may want their parents to look over the book first. For my readers who avoid romance, this book is a romance book, and there is kissing, so you wouldn’t like it. Aw, thanks, Sarah. So glad you liked it. Thanks for the awesome review, Sarah!!! Thanks for the review! This book has been on my list to read. I am a sucker for re-told fairy tales and I love that Melanie Dickerson is writing faith-based ones!